So, Nuremberg is famous for four reasons to do with the war. 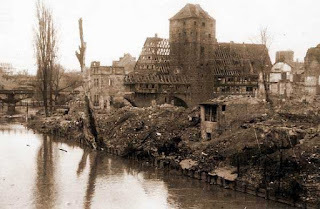 Nuremberg was not bombed much - the major reason the War Crimes trials were held there was that the city had not suffered much war damage, and the courthouse and adjacent were large and intact when the war ended, RAF Bomber Command targetted all major German cities in an attempt to kill as many German civilians as possible. USAAF targetted all railway junctions in Germany (including those in Nuremberg and Munich) so as to destroy the German transport infrastructure and thus damage their war effort.